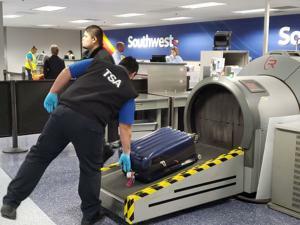 HARLINGEN — TSA agents inspected baggage and checked passengers entering the flight gates at Valley International Airport like any other day. It looked like all hands were on deck. However, currently, those employees are not being paid for their work. In Harlingen, flights were not delayed and most people arriving or departing were not feeling the effects of the government shutdown. Chris Hammond flew into Harlingen on Tuesday. He said the shutdown is not affecting him personally, but it is hurting his cousin, who is a TSA agent in New Jersey. “I disagree with it and everything that is going on,” Hammond said as he waited for his ride. About 800,000 federal government employees are affected. TSA agents, Border Patrol agents and other essential personnel are working, but they didn’t receive a paycheck last Friday. However, when the government is re-opened they are expected to receive back pay. Some are struggling without their regular paychecks. Wednesday, large airports reported TSA agents called in sick, requiring people to arrive for their flights up to three hours ahead of time. TSA agents at Valley International Airport would not comment on their situation. Las Vegas resident Craig Fitzgibbons was traveling back home and said the government shutdown doesn’t bother him. “It impacts your cash flow temporarily,” Fitzgibbons said. He said the federal employees will get paid, and he can put up with a delay at the airport. He believes TSA agents should have never been government employees in the first place. He said he was a government employee for the Department of Defense before he retired and believes the government would have saved millions of dollars had the government contracted TSA employees privately.